What is the number one red flag for poor language skills? Read on to find this and other crucial warning signs. Recently I spoke to my school elementary staff about red flags to be aware of for expressive and receptive language and when is a referral appropriate. I think it is always a good idea to remind teachers what we as SLPs can work on…sometimes it isn’t always clear what exactly we do, right? What should teachers, coaches, and parents need to be looking for? Are there words and behaviors we should be called attention to and possibly evaluate? 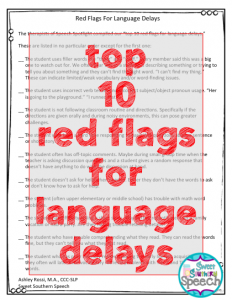 I know I have my list; but I wanted to reach out to the other fantastic therapists of Speech Spotlight for their red flags for language delays. 1). Filler words like “thing” and “stuff.” Every member said this was a big one to watch out for. We often hear this when a student is describing something or trying to tell you about something and they can’t find the right word. “I can’t find my thing.” These can indicate limited or weak vocabulary and/or word-finding issues. 3) Collette from Alberta Speechie mentioned students not being about to follow classroom routine and directions. Specifically if the directions are given orally and during noisy environments, this can pose greater challenges. 4) Tami at TLC Talk Shop wants people to be on the look out for students who have a hard time responding to basic WH-questions about a sentence or short story. 5) Sarah from Speech is Beautiful said to always look for kids with off-topic comments. Maybe during small group time when the teacher is asking discussion questions and a student gives a random response that doesn’t have anything to do with the discussion at hand. 6) Jennifer from Speech Therapy Fun mentioned watching out for when a student doesn’t ask for help when needed. Either they don’t have the words to ask or don’t know how to ask for help. 7) Anne from Beautiful Speech Life said she always wants teacher to be concerned when a student (often upper elementary or middle school) has trouble with math word problems. This is a HUGE language weakness red flag. 8) Lisette from Speech Sprouts said one of her red flags was difficulty telling a short story. Maybe they recently went on a family vacation or had a party. Are they having trouble retelling details? 9) Linda from Looks Like Language said she is always on the watch for students who have trouble comprehending what they read. They can read the words fine, but they can’t tell you what they just read. 10) Susan from Kidz Learn Language said she often sees students who have poor memory retrieval during the early literacy acquisition, then they often will later have vocabulary retrieval problems with Tier 2 and Tier 3 core words. Putting this list together was great for me – it reminded me of how much speech therapists can help in so many ways. Tell us? What are your red flags? What do you come across when discussing student difficulties with classroom teachers? Happy New Year everyone, you can catch me where I blog regularly at Sweet Southern Speech. You can also grab this list in a free download here! What a great list! It is such a good idea to communicate tips like this with your school’s teaching staff so they know who/how we can help! I find teachers are often unsure of what to look for before referral. Great list! 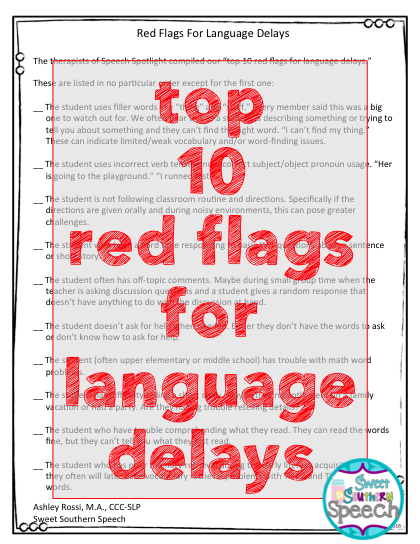 It’s so important for teachers to recognize these red flags! And to know we are there to help.